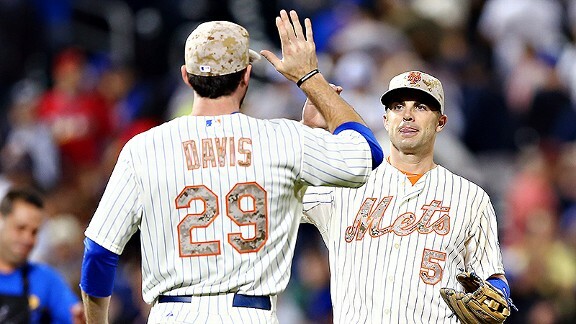 Monday May 27th 2013: The Memorial Day subway series began at Citi Field, this year's version starting for the first time on a Monday, rather than on a weekend series. Through the years the subway series thing has died down & fans have become a lot less interested than they once were. Proof being the back to back two game series during the week. In the first game of the matchup; Mets manager Terry Collins sent Jonathon Niese to the mound against Philip Hughes in front of 32,000 at Citi Field. Both pitchers pitched well, holding each other scoreless through five innings, scattering a few harmless hits along the way. In the top of the 6th Bret Gardner, tripled down the left field line & scored on a Jayson Nix base hit. In the home 7th, Mets Captain David Wright took things into his own hands, blasting a long HR to left center field. In the bottom of the 8th pinch hitter Jordany Valdespin, drew a walk & advanced on a passed ball from pitcher Dave Robertson. Ruben Tejada then chopped a grounder to second, Mike Baxter attempted to score, running on contact & was nailed out at home. With two out, Daniel Murphy, who had been robbed of a HR in the 6th inning, when Bret Gardner caught the ball off the top of the fence, came through. He singled to center field, scoring Valdespin who ended up being the game winning run. In the 9th Bobby Parnell struck out David Adams, but then walked Ichiro Suzuki putting the tying run on base. Parnell who is developing into a fine closer, struck out Lyle Overbay & got Travis Hafner to pop out fr the last out. Mets up one game to none. Tuesday May 28th 2013: In the second game at Citi Field, the Mets Fred Wilpon let Mariano Rivera throw out the ceremonial first pitch to former Mets reliever John Franco. Call me a bad sport, buy giving an honor like that to a long time rival is not something I support. A crowd of 31,877 filled up Citi Field. There was a lot of excitement around the park, because the latest Mets star pitcher Matt Harvey was taking the mound. Harvey came into the game at 5-0 with a 1.93 ERA (third in the NL) & 74 strike outs (second in the NL). 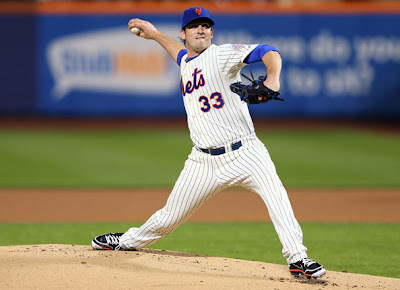 Harvey did not disappoint, he struck out eight through the first six innings & allowed just one hit. In the 8th inning, he took a line drive to the back, picked up the ball through to first & waved off the trainers. He was fine, taking charge & inspiring his team, in their final at bat. During the game former Mets All Star pitcher; Dwight Gooden sat in the stands, updating Harvey's K count on twitter- as usual. After rolling along, in the 6th inning; Bret Gardner singled to right field, on the play he advanced to second as Marlon Byrd booted the ball. With two out, Lyle Overbay blasted a shot through the middle behind Harvey, scoring the first run of the game. 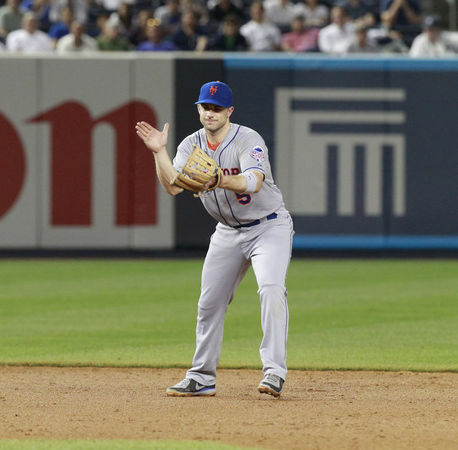 In the bottom of the inning, Ruben Tejada was picked off second base in a close call. 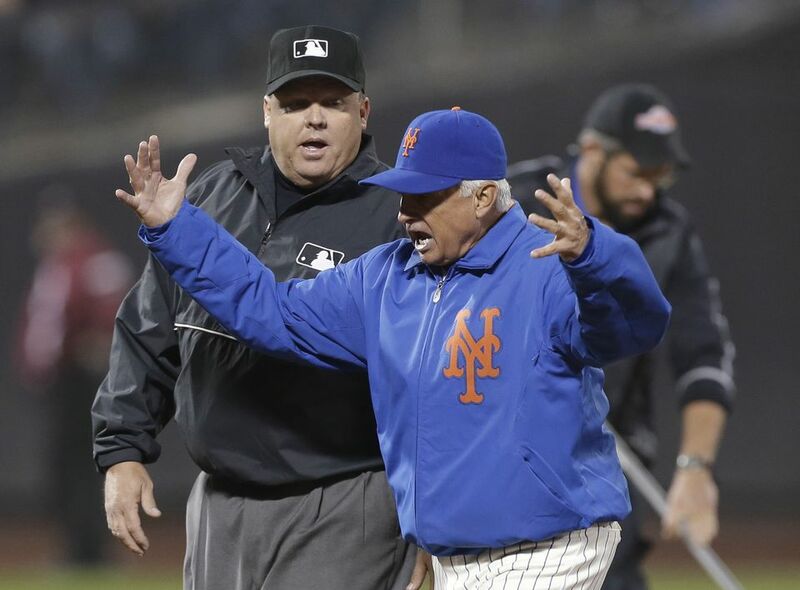 Manager Terry Collins got into a heated argument with umpire Adrian Johnson & was ejected from the game. On the A.L. New York's team side, pitcher Hiroki Kuroda was also rolling along; allowing just four hits through seven innings with seven strike outs. In the 9th inning, Mariano Rivera came to the mound to try to close it out. He had everyone thinking it was going to be a done deal, since he had not blown a save yet all season. But it was not meant to be, for tonight he would not get one Mets batter out & would leave the mound with his first loss of the year. 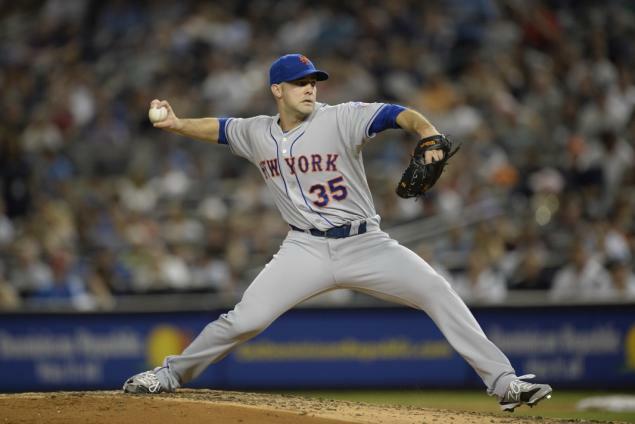 In his career, the second highest ERA he had allowed to any team had been to the New York Mets. Daniel Murphy, the hero of last night's game, led off with a ground rule double to left field. 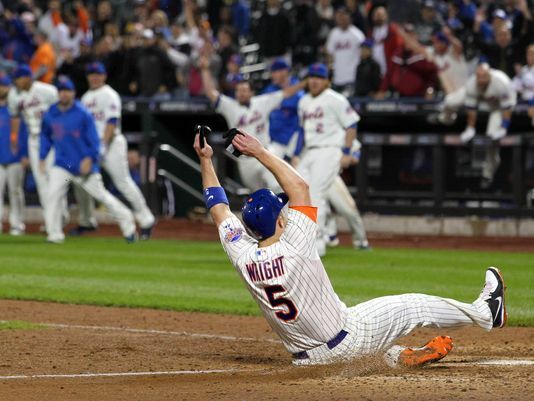 Captain David Wright, another hero of last night's game, took charge tying up the game with a single to center. Mr. Rivera's head spun around as he still had not recorded an out. Then Lucas Duda, came through with a line drive into short right field, that dropped in for the hit, Wright motored around third scoring the winning run as the Mets fans went wild. 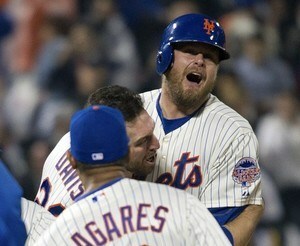 Duda had his second walk off winning hit of his career & Rivera had his third walk off loss to the Mets. The winning pitcher was Scott Rice who went to 3-3 after pitching a scoreless 9th inning. Matt Harevy although he got no decision, he kept himself at 5-0, as he had pitched eight inning, allowing one run on six hits while striking out ten batters. It was an exciting night for the Mets & their fans. Mets sweep at home, up two games to none. 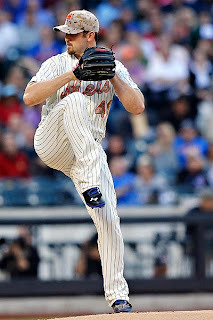 Wednesday May 29th 2013: The series switched across town to the Bronx, as 43,000 fans came out for Wednesday nights matchup of Jeremy Hefner (0-5) looking for his first win, against David Phelps (3-2). 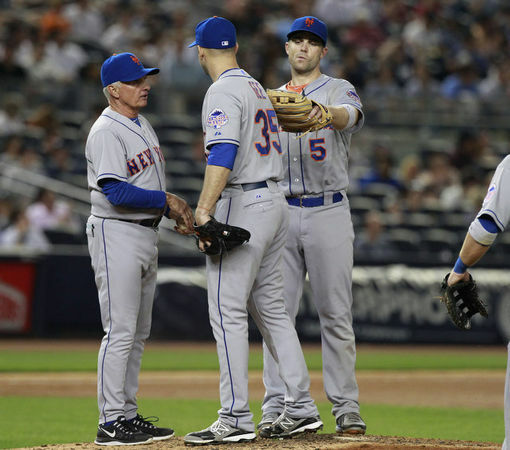 Before the game, Manager Terry Collins called Ike Davis & Ruben Tejada into his office for a private closed door meeting. The two players, who are key members of the Mets infield have been struggling mightily. Davis was batting .160 with just 4 HRs & a previous 1-42 slump, striking out 18 times. 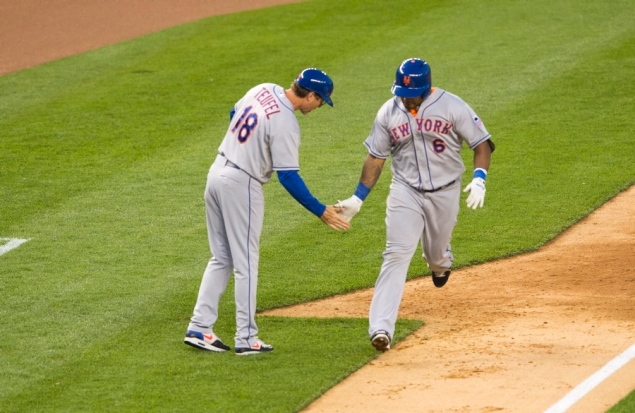 Tejada was hitting .209 & was making mental errors on defense, which was normally his strong point. The players were both told, that if their play didn't pick up, they would be headed for the minor leagues. Quotes: Terry Collins said: "We're 50 games into it, All the kinks should be out by now. There are guys that play very well when they're comfortable, and maybe there's those guys who play even more aggressively when they're standing on the edge, We'll find out." The Mets first inning, certainly was an exciting one, fresh off the sweep at Citi the Mets continued; Tejada responded with a lead off base hit then Daniel Murphy doubled to bring in the first run. 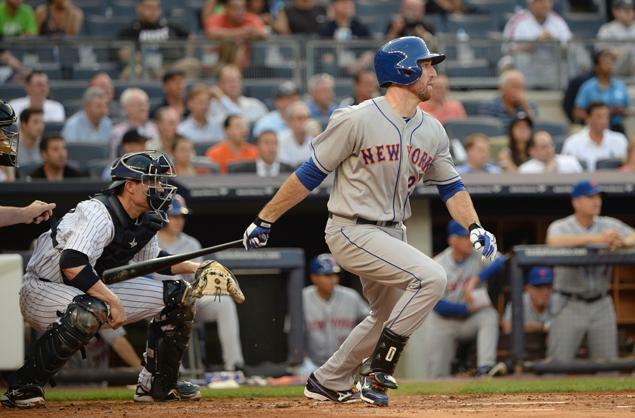 David Wright walked & with one out John Buck singled to right field bringing in Murphy. Rick Ankiel drew a walk loading the bases. Marlon Byrd hit a double play ball to third base, but Jason Nix booted the ball & Wright scored. 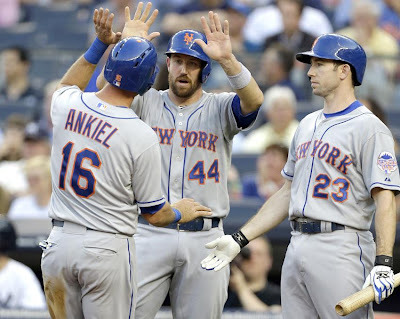 Next; Ike Davis responded to his managers meeting with a base hit to left center scoring Buck & Ankiel, making it 5-0. It was the first of Ike's two hits on the night. Phelps was knocked out of the first inning, taking the loss. 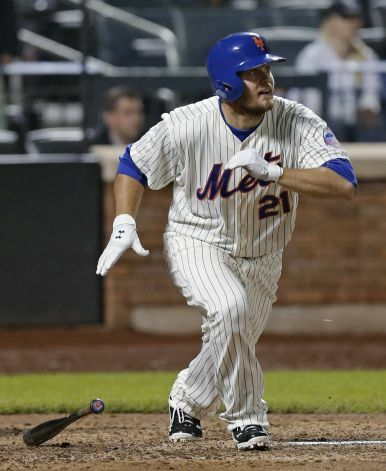 The Mets sent ten men to the plate, scoring five runs on four hits two walks & a costly error. Hefner went on to his first win of the year, going six innings allowing three runs on nine hits with five strike outs. In the top of the 3rd, Marlon Byrd added a solo HR. In the 4th Lucas Duda, one of the previous nights heroes, doubled, scoring David Wright & Mike Baxter ,making it 8-0. 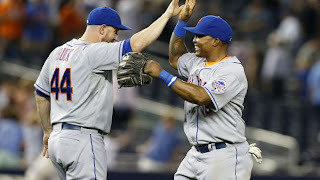 Rick Ankiel added a 9th inning RBI base hit topping off the 9-4 Mets win. Latroy Hawkins closed out the game- Mets up three games to none. In that 9th inning, Ruben Tejada injured himself going after a pop fly & sliding out of Lucas Duda's way. He was placed on the DL, hoping the rest will get him back on track when healthy. 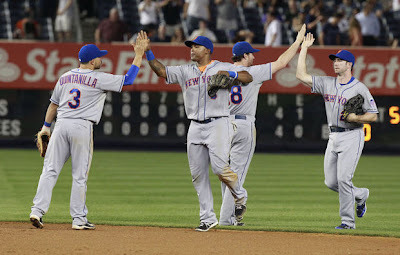 Thursday: The Mets were excited looking for a series sweep as the AL New York team was trying to salvage a game. Dillon Gee (2-6) was coming off a personal two game loss streak & entered with an ERA over six. Gee's place in the rotation is also in jeopardy, as Zack Wheeler is getting ready to be brought up from the minors, very soon. Justin Turner, playing first base tonight, as Ike Davis got the night off, led off with a double but the Mets failed to score off Vidal Nuno. In the 2nd, Lucas Duda drew a lead off walk & Marlon Byrd blasted a HR to left field in the second deck, putting the Mets up 2-0. It was Byrd's second HR in two nights, number six on the year. Gee served up a HR in the bottom of the inning, but it was the only run he would allow, the only run the AL New York team would get as well. Gee was fantastic stealing the show, he pitched into the 8th inning allowing just four hits striking out twelve, earning the win, leading the Mets to the series sweep. In the 8th inning, the Mets added an insurance run, as Omar Quintanilla (filling in for the injured Tejada) walked, advancing to second on a fielder's choice. 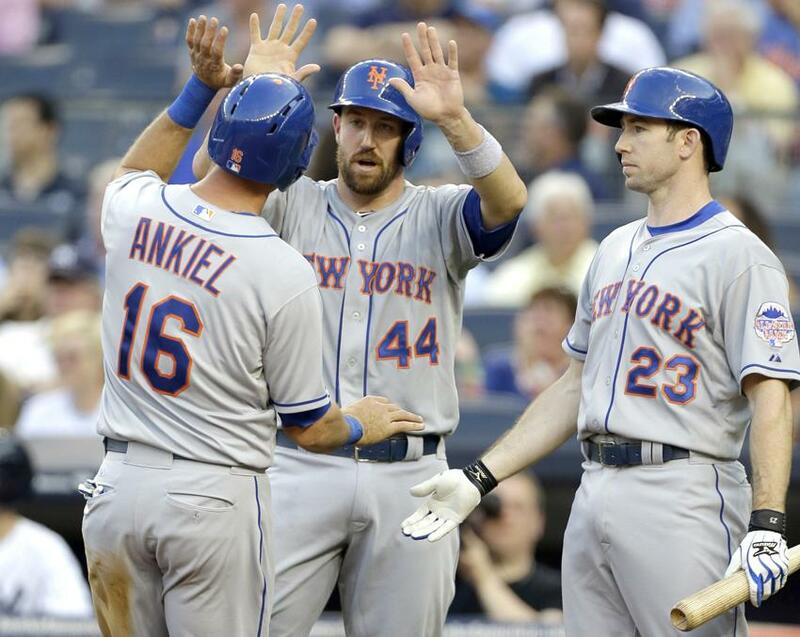 With two outs, David Wright was walked & John Buck followed with another RBI base hit. It was just a dribbler down third base, but enough for his his team leading 35th RBI of the year (6th most in the NL). Buck greeted Joba Chamberlin who had just come back from the DL, with that hit. The Mets Scott Rice, who has been pitching better each day, held down the cross town rivals, as Bobby Parnell closed the door for his ninth save & twentieth game finished on the year (4th in the league). It was the first time the Mets swept the entire subway series in interleague play; Mets four games- cross town rivals none. 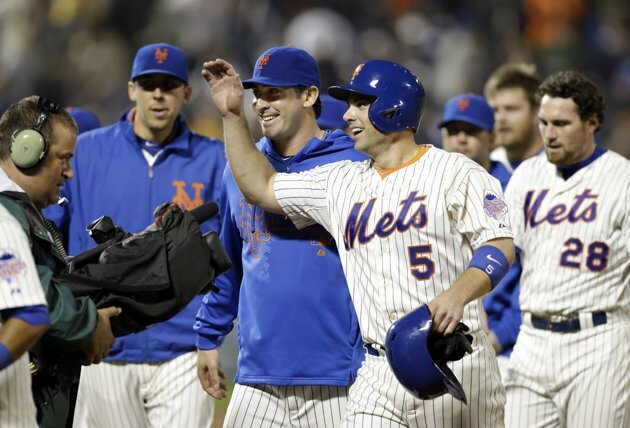 Quotes: Manager Terry Collins: The hardest thing I've done is try to keep these guys positive. It wasn't about changing stances or shuffling bullpens. It was about trying to keep the guys in the clubhouse positive. Everybody goes through some bad times. You've got to work your way out of it."